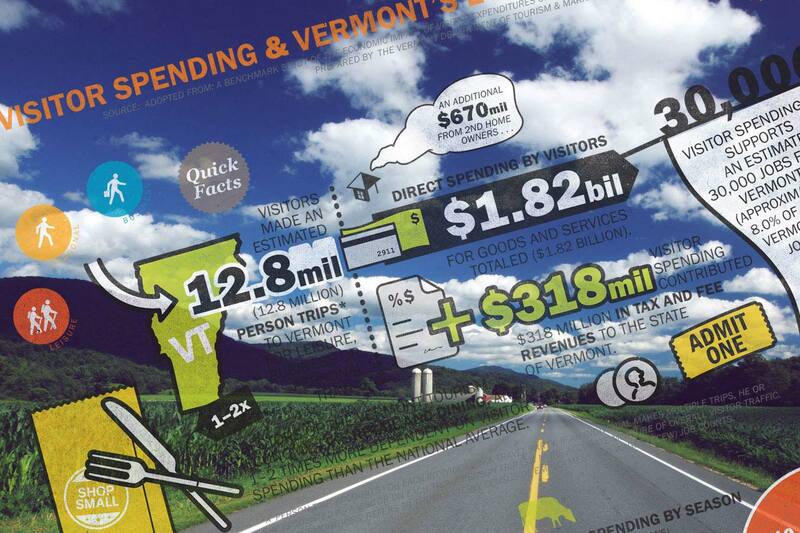 The impact of tourism on Vermont’s economy is significant. In 2017, tourism brought in more than $2.8 billion up from $2.6 billion in 2015. The Vermont Department of Tourism and Marketing provides valuable research and information for your business plan or marketing campaign. VermontVacation.com is the official Vermont State Tourism Website. All of the department’s tourism advertising drives directly back to this website. The trip planning tool offers listings to Vermont’s tourism businesses. Tourism is one of the largest industries in Vermont, as the state welcomes nearly 13 million visitors each year. These visitors account for close to $2.5 billion in annual spending on lodging, food and drink, goods and services. Summertime is the busiest time of year for tourism in Vermont. More than 5 million people travel to the state to enjoy its abundant outdoors and other attractions during the summer. The state is also famous around the world for its beautiful fall foliage colors, when tourists flock to Vermont’s byways to enjoy the spectacular change of seasons. During the winter months, Vermont’s world class ski resorts are the most popular destination in the Northeast for skiing and riding. In springtime, Vermont is consistently the top producer of maple syrup in the country. To promote Vermont’s travel, recreation, cultural and historic attractions, as well as the state’s goods and services, in coordination with public and private sector partners and to market to a global audience in a manner consistent with the values and traditions of the state for the economic benefit of all Vermonters.